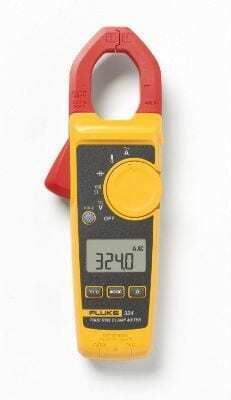 Fluke 324 True RMS clamp meter is a clamp meter made by the renown multimeter company Fluke. This meter comes from a 32- series of clamp meters and Fluke 324, like all other meters from this series, hasn’t gone through any restyling because this model is at the top of its class. The only part of the package that could use improved quality are standard multimeter test leads. Everything needed comes in the package. The package itself is sturdy enough for shipment, which means that you will recieve your Fluke 324 undamaged. The rubber on the standard test leads could be a bit thicker. Fluke 324 is CAT III and CAT IV certified. The range of features is suited to the clientelle at whom this meter is aimed at. The only issue could be the lack of DC amp reading ability. Fluke 324 is accurate when you take it out of the box. Since the manufacturer advises the users to calibrate Fluke 324 before use, the final level of accuracy is incredible and features of this meter are competition for meters at higher price ranges. Excellent quality of build. Made of strong plastic that is resistant to falls and all other types of force. This meter is one of the easiest ones to use. I have honestly never seen a meter so easy to use. They are of good quality as they are, but since Fluke 324’s quality is above its price range they give out an impression that the test leads are somewhat behind. Considering the price, the items shipped in this package are superb. Fluke 324 can be used by everyone, from begginers to advanced, experienced users. This multimeter will prove its worth the most for users that are HVAC, electricians and electrionics technicians. Ease of use of this meter will impress all users, but inexperienced users will be the ones that are impressed the most. The quality of this product is well above its price range. Fluke 324 comes shipped inside the carrying case. When you open the case, besides Fluke 324, you will find temperature probes, protective caps for test leads, red and black multimeter standard test leads and the user manual inside. Protective case that is shipped with the multimeter has a soft padding and the outside is made of artificial leather that is resistant to scratches, but it can be punctured by a sharp object if poked with moderate force. The temperature probes are accurate, although the manufacturer claims that they need to be callibrated. Look: If that statement is true, that means that temperature probes can measure temperature even more precisely because they are precise and accurate as soon as you take them out of the box for the first time. The only problem with temperature probes is that they are thin and the rubber with which they are encased seems fragile. Standard test leads share this problem. Besides that, they seem to be accurate and do their job well. Standard test leads also come with protective caps that can be placed on them with ease. These caps are used for situations where you need to measure something with probes in a very tight space and you want to prevent overload that could easily happen if you acidentally make the probes touch. The caps are made of thick rubber that is suitable for the job. Both the standard and temperature test leads are very long and flexible, that’s a very important upside that removes the negative impression made by the thin width of the wires. And it’s better this way because the target audience at whom this meter is aimed at are workers in HVAC industry that can afford to sacrifice a bit of safety for a lot more mobility. The instructions in the manual provide detailed descriptions of procedures to follow when using Fluke 324. Fluke 324 is made of strong and sturdy plastic. Lack of a protective rubber glove can be forgiven once you realise that the plastic casing, in combination with low weight of this meter is enough to protect it from falls and most of the damage that could be caused by other forces. The back light is blue and it is very gentle on the eyes in low light environments. Contrast between the letters and the back light is very nicely executed so any eye strain is unlikely to occur. There is only one degree of the back light power, but that’s quite fine since battery consumption is not as nearly as high as it is in some other models. Fluke 324 is turned on by rotating the dial in the middle on some of the desired settings. It can be a little bit weird to try to rotate the dial since it doesn’t have anything for the user to hold onto while rotating, but that’s fine because the meter has lost some of its silhouette that would otherwise be a lot wider if the manufacturer had decided to place something to hold on to while rotating the dial. Modes of measurment that this meter contains are AC and DC volts, resistance, capacitor resistance and continuity, temperature and amps. All standard functions work well and show accurate measurements. Temperature output can be shown in degrees Celsius and degrees Fahrenheit, as the user desires. Fluke 324 model does not have the ability to measure DC amps via the clamp, so that’s not so good. The clamp works well and it is neither too hard nor too easy to pull and hold. The backisde of Fluke 324 is that it does not contain a magnet. That could be a problem for users that need to leave the meter on the metallic surface to grab or do something else while measuring temperature. The fuse that comes inside is a quality fuse that instills the feeling of confidence and security in the user. If you work with really high voltages, you could get a better fuse, but this one is quite all right for most of the average users. Fluke 324 is CAT IV 300 V, CAT III 600 V and IEC standard 61010-1 certified. Fluke 324 is more compact than other meters on the market. When you pair that with its low weight, you get a very neat product that is excellent for users that work in and need to conduct measurments in tight spaces, with as little encumberment as possible. It’s easier to use than every other meter out there, just select the desired setting and use the probes. This is an excellent multimeter for begginers and advanced users. Trainees could benefit a lot from the simplified, yet accurate features, while the experienced users will be happy to know that this multimeter is at the top when it comes to accuracy and its compact size. Download Fluke 324 Clamp meter User Manual – Here! Related posts about Fluke 324 Clamp meter in Forums – Here! This is an excellent multimeter for begginers and advanced users. Trainees could benefit a lot from the simplified, yet accurate features, while the experienced users will be happy to know that this multimeter is at the top when it comes to accuracy and its compact size.